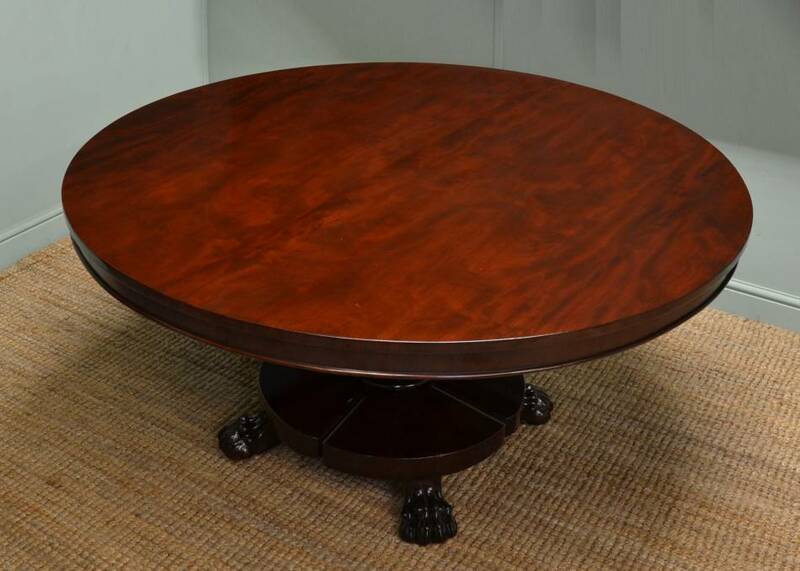 The Antique Circular Table or Round Table comes in many forms from a small occasional table to a larger dining table. The earliest forms were from as far back as the famous King Arthur’s round Table in the 15th Century. The early Georgian period was the first time the round table was started to be made on a larger scale, usually in Oak or other more primitive locally sourced timbers used to sit candles on or for writing at. As time progressed the Late Georgian and Victorian era, introduced more rich timbers like Mahogany, Rosewood and figured walnuts often with fine inlay or carved decorations on the edges. 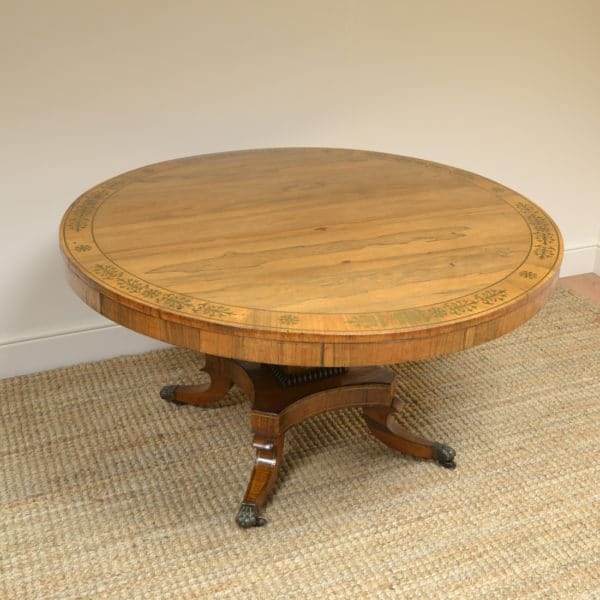 Antique circular tables were the most well used form of table throughout history as they are such a useful design, they can fit anywhere in the home and be used for simple things like to place a lamp on, your glass of wine to being able to use them for dining on if you have a smaller party of people. Have a look below at our lovely examples available for sale. Below are some circular tables we have sold in the past, but we do get similar examples in stock so let us know if any looks of interest. 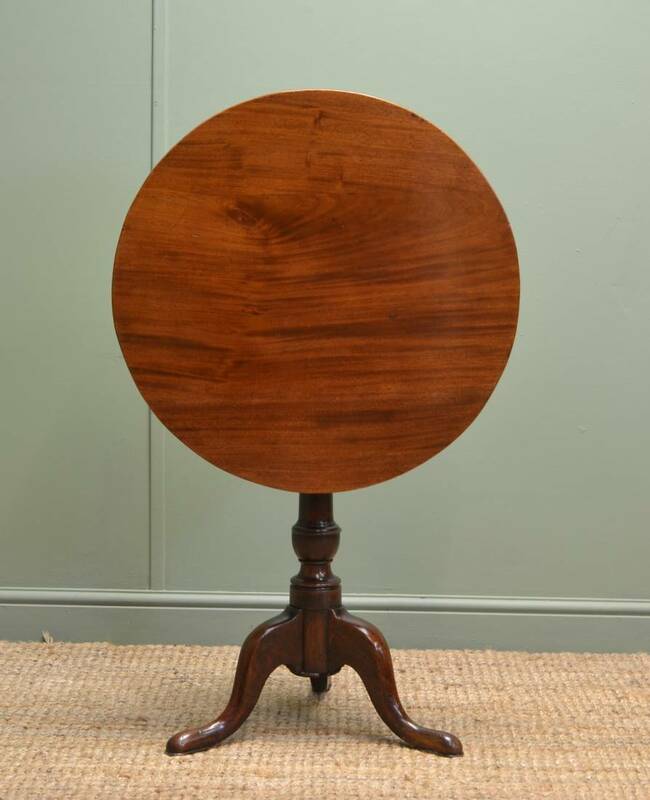 Victorian, Flamed Mahogany, Segmented Top, Circular, Antique Dining Table. 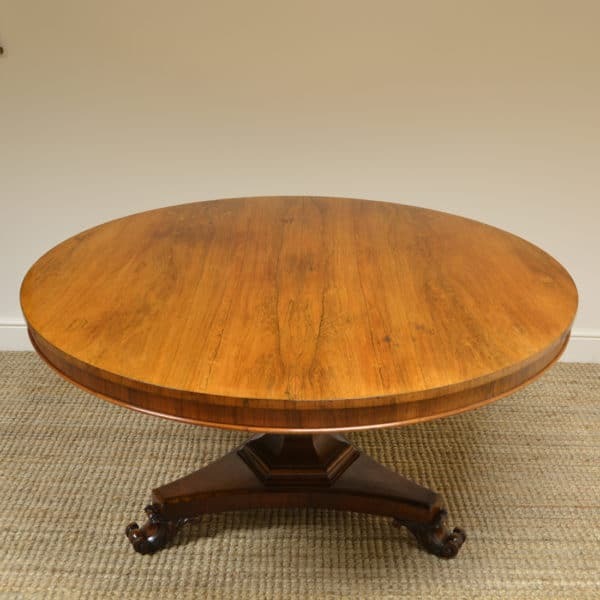 Dating from around 1870 this gorgeous circular antique dining table has a striking, flamed mahogany segmented top, its style being typically Victorian. 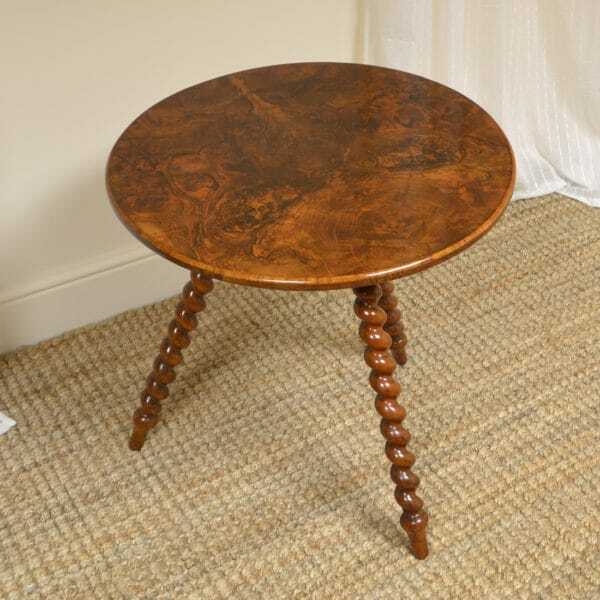 The table stands on a bulbous turned reeded pedestal with three beautifully scrolled carved legs. 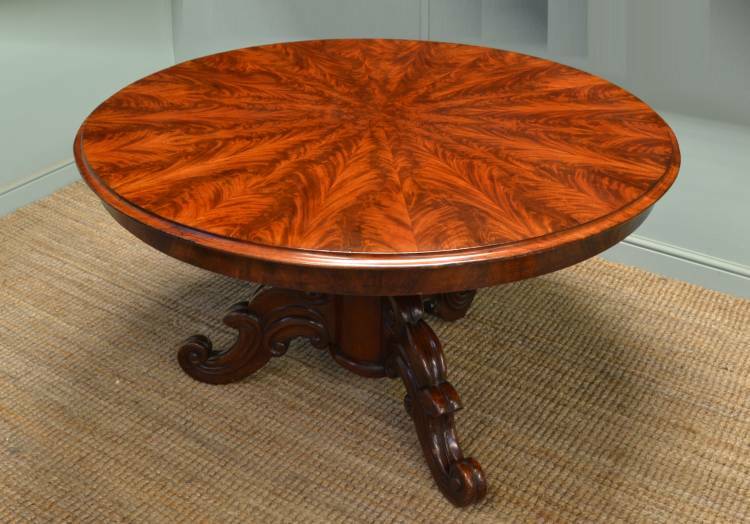 The moulded top is stunning, made up of segments of flamed mahogany making it an extremely eye catching piece. 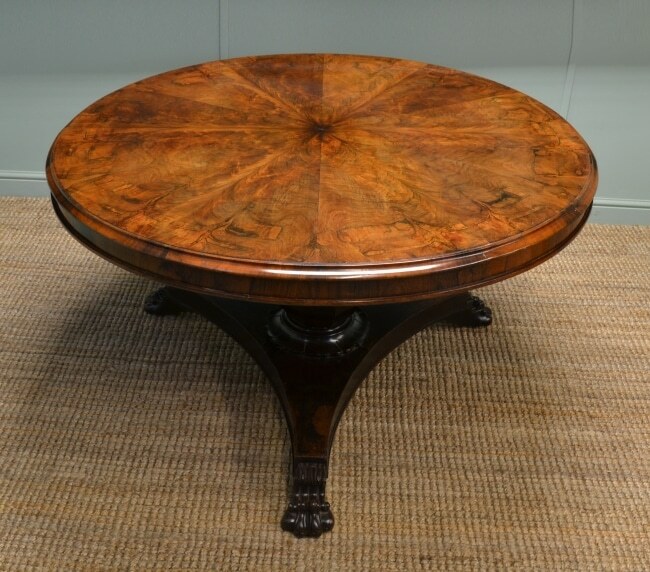 William IV Rosewood Segmented Circular Top Antique Dining Table. 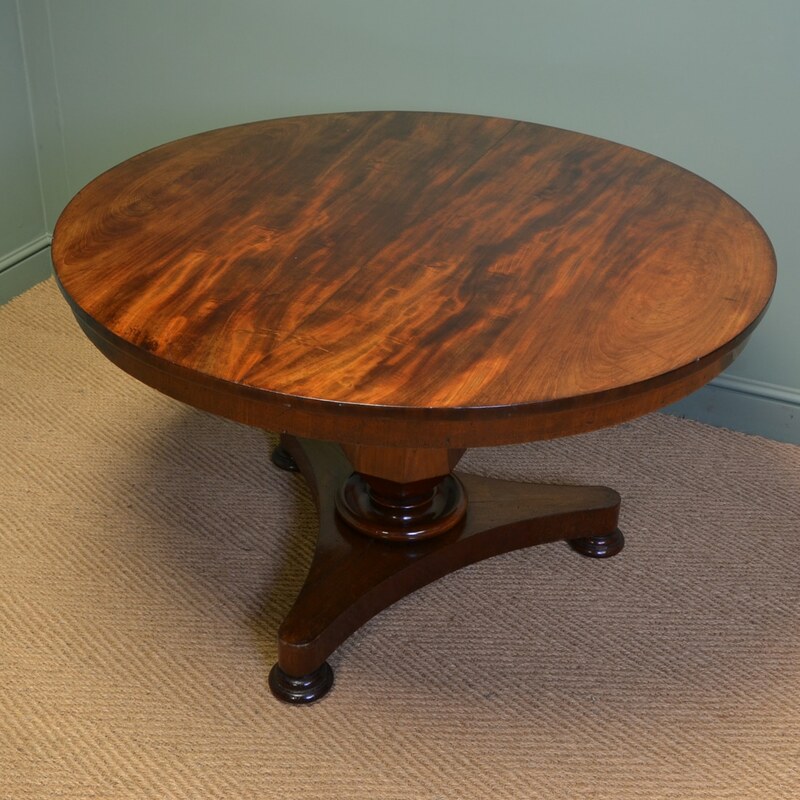 This beautiful segmented circular top antique dining table dates from around 1835 in the period of William IV and is made from rosewood. The circular top has a moulded edge and is delightfully figured, it also tilts using the original brass mechanism. The central octagonal bulbous pedestal has a decorative base and stands on a tripod platform with three quality carved lion paw feet with castors. This eye catching antique table would prove an ideal centre piece in a grand hallway or provide the perfect setting for an intimate dinner with friends. 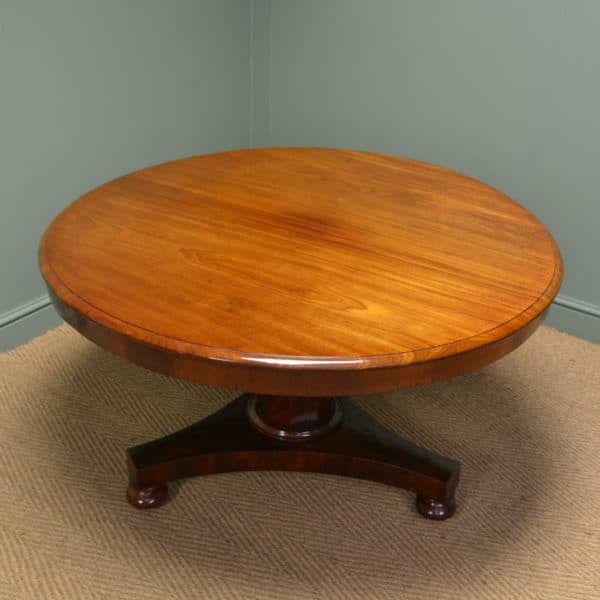 Large Circular William IV Mahogany Antique Dining Table. 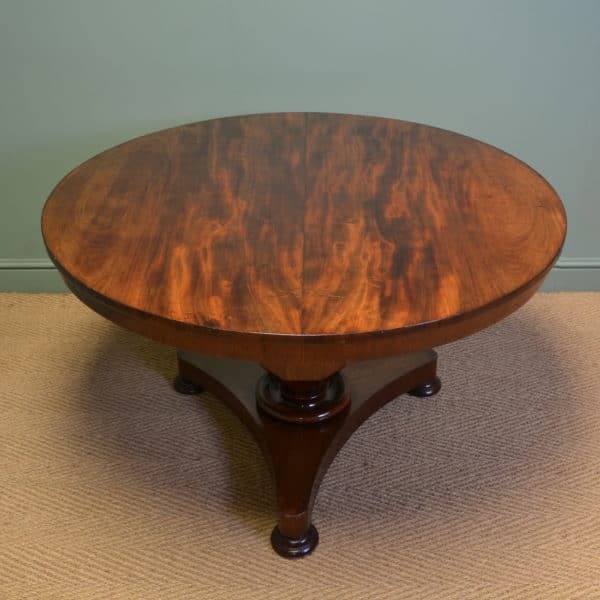 This magnificent example of a William IV antique dining table dates from around 1835 and is constructed from mahogany. 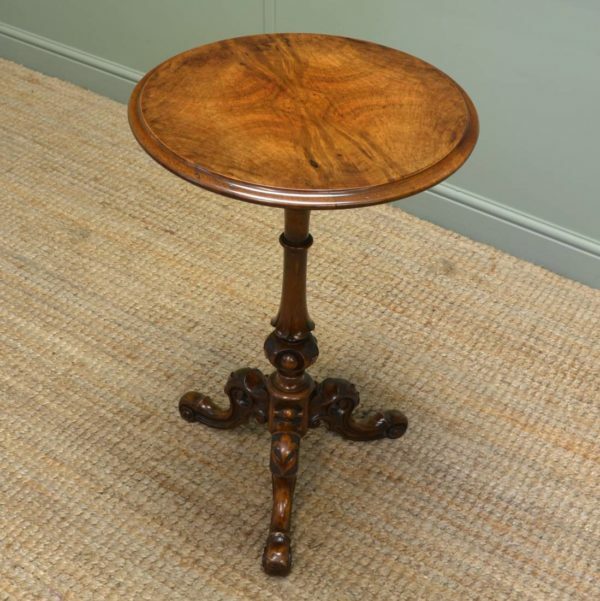 It has a beautifully figured large circular tilting top which stands on a bulbous central pedestal on a clover leaf designed base. The whole table then sits on the most fabulously carved lion paw feet and brass castors. With a very comfortable seating capacity of six, this is definitely a table that needs to be seen in the flesh to fully appreciate its grandeur. 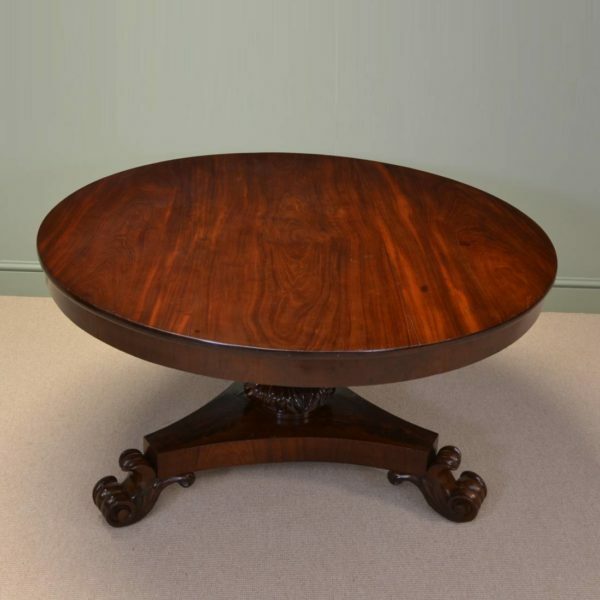 This typical Georgian, circa 1800, antique table is made from mahogany and would prove to be ideal for many a different occasion. 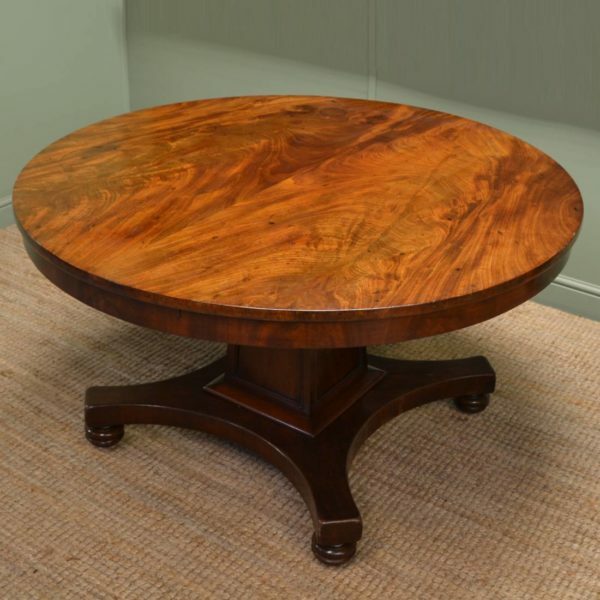 The circular top is beautifully figured and made from solid mahogany. It still retains the original mechanism that allows it to tilt upright when not in use. It stands on a central turned pedestal and has tripod splayed legs with pad feet. 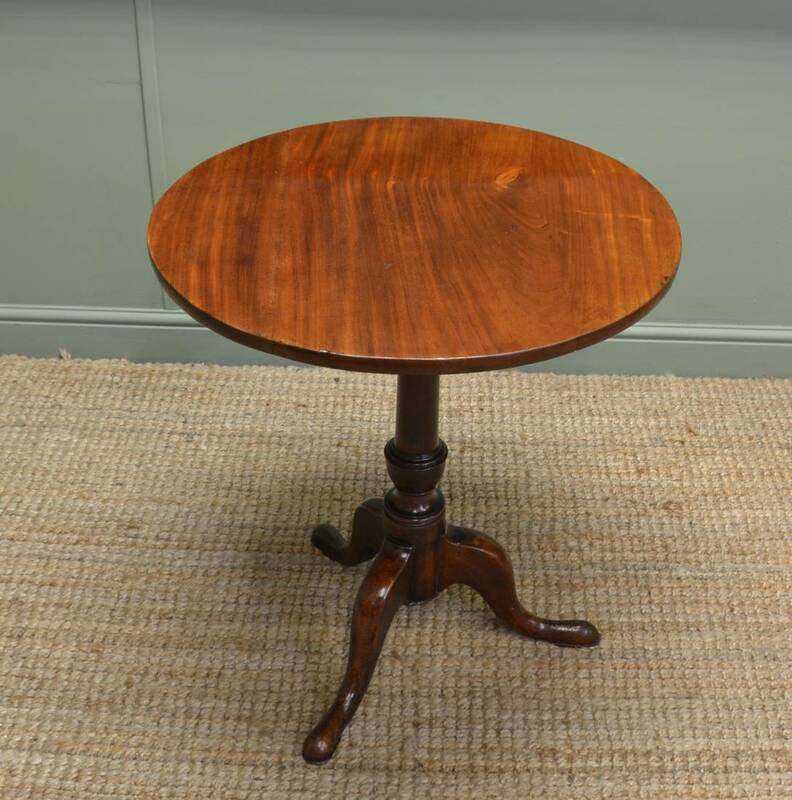 Dating from around 1880 in the Victorian period this antique walnut Circular occasional table is full of the charm and character from the time. 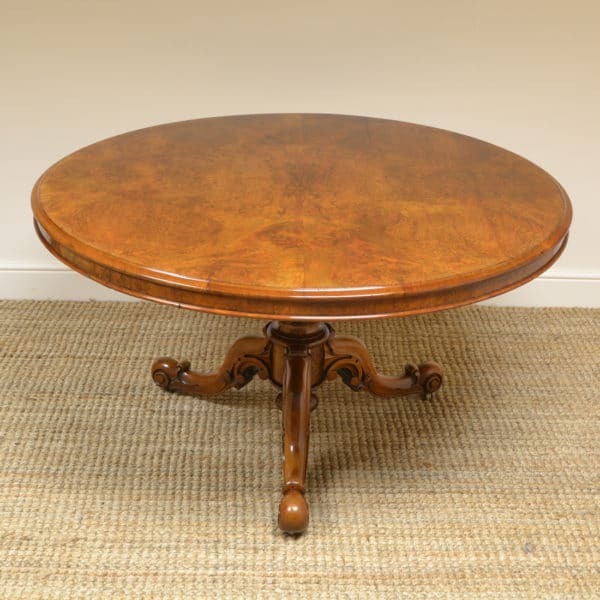 It has a beautifully figured one piece circular top supported by a central turned pedestal. 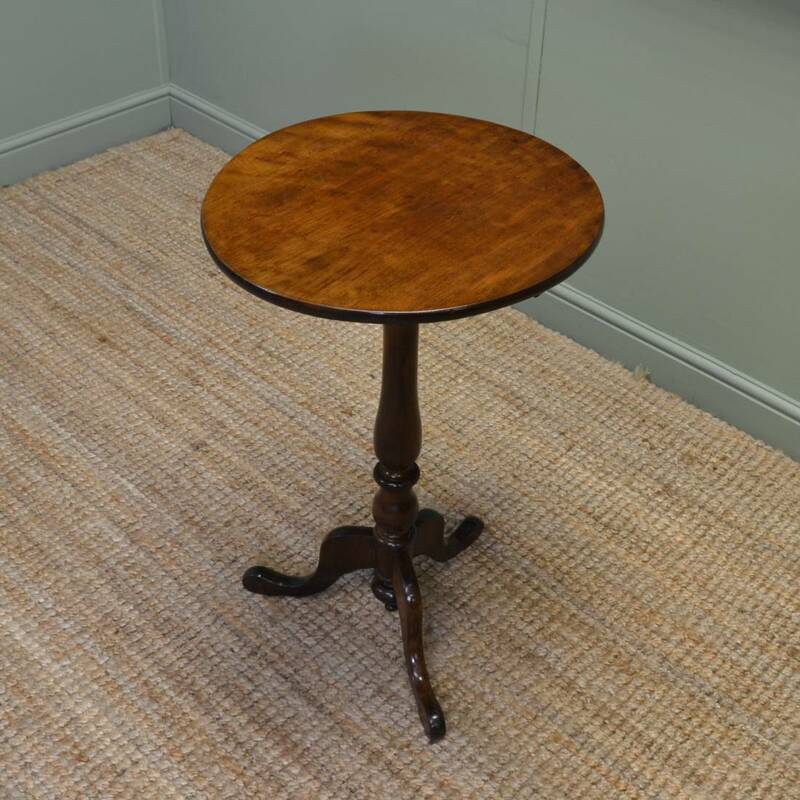 The table stands on splayed legs with a decorative central finial. It has benefitted from additional structural support earlier in its life making it a very usable, attractive table and is priced accordingly.